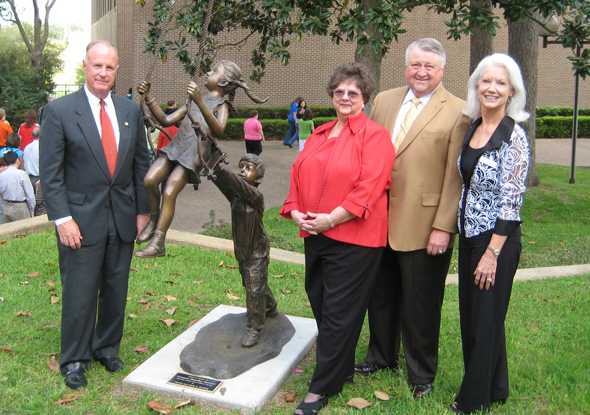 Huntsville residents, College of Education professors and students, and other university employees gathered Tuesday afternoon outside the Teacher Education Center to dedicate a statue of two children at play in memory of former Sam Houston State University first lady Frances Bowers. Linda Bowers Rushing, second from left, said her mother taught in Huntsville public schools for 25 years, mostly in the fifth grade. Genevieve Brown, right, dean of the College of Education, said the statue will serve as an inspiration to SHSU's graduates who become teachers. Jim Gaertner, left, SHSU president, complimented the quality of the SHSU teacher training program, which is the oldest in the Southwest. Also participating in the ceremony was Linda Bowers Rushing's husband, Charles Rushing. More.